Trifles are traditionally served in a large glass bowl so all the layers can be clearly seen and enjoyed. This makes it the perfect dessert for large gatherings, but not so good when you have only a few people. To solve this problem I decided to make individual trifles. 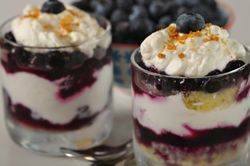 These small trifles still start with a layer of cake, followed by a blueberry sauce laced with lemon liqueur, then I add a few fresh blueberries, ending with a dollop of whipped cream made with heavy cream and mascarpone cheese. I also like to garnish the top with a sprinkling of crushed gingersnap cookies as they add a touch of spiciness. The beauty of a trifle is that variations exist for every layer. For the cake layer you can use a butter cake, a sponge cake, a pound cake, angel food cake, or even ladyfingers. Next, a blueberry sauce, which I like to lace with a lemon liqueur, although you can leave it out. Then I like to sprinkle some fresh blueberries over the sauce, although you could use other berries or even chunks of fresh peaches, nectarines, pears, or kiwi. For the next layer I use a whipped cream layer that includes mascarpone cream. Mascarpone is a soft unripened cheese that belongs to the cream cheese family. It is a thick, buttery-rich, sweet and velvety, ivory-colored cheese that has the texture of clotted or sour cream. It is often sold in plastic 8 ounce (240 ml) tubs and can be found in specialty food stores and in the deli section of grocery stores. To decorate the trifle I like to sprinkle the top with crushed Gingersnap cookies (store bought or home made). Toasted nuts or even fruit could also be used to top the trifle. This trifle recipe does benefit from chilling in the refrigerator for at least four hours, preferably overight, before serving. Read more about the English Trifles. Remove from heat and stir in the lemon zest, lemon juice, and lemon liqueur. Let cool completely before using. The blueberry sauce can be made up to a week ahead. Just cover and refrigerate. Cake: You will need 12 thin slices of cake. To determine the diameter of your cake slices, first measure the diameter of six small glasses and then use a cookie cutter to cut your cake rounds. Whipped Cream: Place the cream, mascarpone, sugar, and vanilla extract in a large bowl. Using a wire whisk, whip until soft peaks form. To Assemble the Trifles: Place one slice of cake in the bottom of each glass. Spoon about 2 tablespoons of Blueberry Sauce on top of each round of cake. Cover the sauce with a few fresh blueberries. Place a large dollop of the whipped cream on top of the berries. Repeat the layers, starting with the cake. Cover and refrigerate for 4 to 24 hours to allow the flavors to mingle. If desired, just before serving sprinkle each trifle with crushed Gingersnap Cookies. Makes about 6 - 1 cup servings. Preparation time 15 minutes.